This 3-day class introduces Participants to the software’s user interface and the basic building components that make the Autodesk Revit Structure software a powerful and flexible structural modeling tool. The instructor will guide the student to create detailed architectural models and documentation in Revit Structure. This course includes an introduction to the user interface; hands-on experience drawing and editing Revit elements; viewing and manipulating objects in 3D; and producing design documentation from a Revit model and imported CAD entities. Detailed instructions for building the most common structural components, such as columns, walls, foundations, beams and bracings, and ramps and stairs, which Participants can recreate in Participants own architectural drawings. Schedule of upcoming Revit training classes. 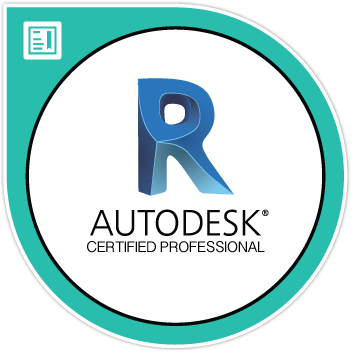 The Revit Certified Professional badge validates professional users’ advanced knowledge of the tools, features, and common tasks of Revit. Earners of this designation have demonstrated advanced knowledge of modeling, documentation, elements, and more using Revit.